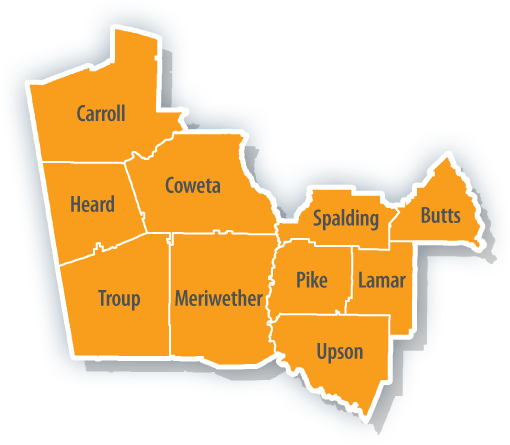 Welcome to the website of the Three Rivers Regional Commission (TRRC), a 10-county regional planning commission that includes the West Central Georgia counties of Butts, Carroll, Coweta, Heard, Lamar, Meriwether, Pike, Spalding, Troup and Upson. Aging Services – senior centers, adult day care, meals at home and in group settings, caregiver support, transportation, senior job training, health screenings, and more. TRRC is a regional planning organization created and managed under Georgia law by its member local governments. As a quasi-governmental agency, TRRC essentially develops, promotes, and provides comprehensive planning and development services and technical assistance that seek to make the local communities in its region better places to live and work.